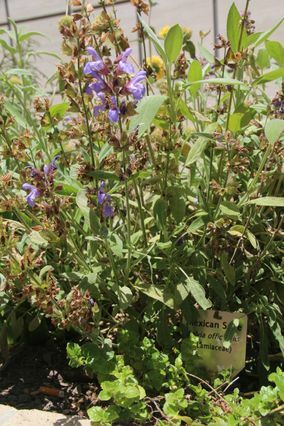 Sage is one in a collection of 40 plants growing in a new medicinal herb garden at the Ronald Reagan UCLA Medical Center. Most of us know that aloe vera soothes burns and minor skin irritations, that echinacea helps boost our immune systems and that a hot cup of mint tea can ease a sore stomach. But what about marigold, bamboo, cilantro, oregano, agave, yarrow and hibiscus? Are these plants also prescriptions for wellness? As visitors peruse a new medicinal herb garden, located on the south side of the Ronald Reagan UCLA Medical Center, questions related to the natural healing properties found in these plants are piquing curiosity and sparking dialogue. The garden is the first of its kind for UCLA and one of just a few nationwide located on the grounds of a working hospital, said Dr. Wendy Slusser, medical director of the Fit for Health Program at the Mattel Children's Hospital UCLA. She’s also associate clinical professor in the UCLA schools of medicine and public health, and chair of the UCLA Healthy Campus Initiative’s diet and nutrition committee. Slusser, along with philanthropist Jane Semel and Susan Salter Reynolds, spearheaded the garden project as part of the initiative with the support of Dr. David Feinberg, associate vice chancellor and CEO of the UCLA hospital system. 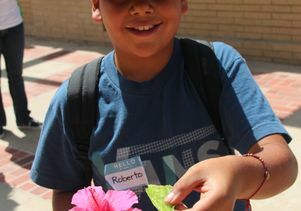 The garden, which also received funding from a grant from the Leon Lowenstein Foundation, is used as an educational tool. It contains 40 varieties of plants that have been used medicinally in Mexican, Chinese, Native American (California and the southwest), European and American households to treat a wide variety of illnesses for thousands of years. Medicinal or "physic" gardens were once a common feature in hospital settings, but at some point in time they fell out of favor, said Semel, adding that traditional medicines have been used around the world for thousands of years. "As a society, we somehow moved away from this tradition, but we are starting to come full circle in our awareness that many of the answers to improved health can be found naturally in common plants." With a bed of Mexican herbs growing adjacent to a Chinese herb bed among other sections filled with other herbs, the garden is becoming a focal point for hospital staff, visitors and patients alike, said Salter Reynolds, the garden’s primary program coordinator, planner and gardener. "People of all ages often stop while we are planting and share stories of how these plants were — and often still are — used in their homes," said Salter Reynolds. "I believe there's something very comforting about the idea that not all medicine comes from a drugstore, but also from the earth." The natural medicine cabinet has also become part of official hospital tours and became a "classroom" for UCLA students in Slusser’s Fiat Lux class, "Eating and Our Food Chain," who got their hands dirty last quarter by adding to the bounty. "It was a great opportunity for them to relax, have conversations about gardening and get to know one another," said Slusser. 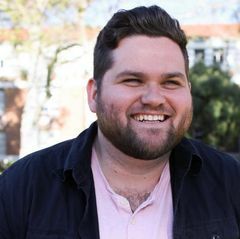 "As freshmen, they get a lot of lecture-style kinds of teaching, which can be somewhat dry and uninspiring. They told me they would much rather have these kinds of experiential learning experiences." 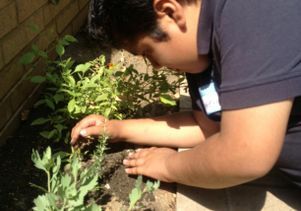 Students from Gulf Avenue Elementary School learned about and planted herbs during a field trip to the medicinal garden. 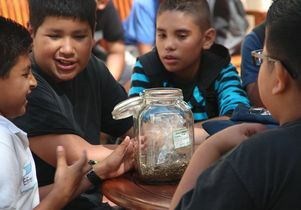 On another day at the end of May, nearly 100 fifth grade students from Gulf Avenue Elementary School in Wilmington came to the garden for a little hands-on learning. They handled a variety of plants, including chocolate and coffee plants, smelled different varieties of herbal tea leaves, learned about medicinal herbs and got their hands dirty by planting rosemary and thyme. "I think they really enjoyed it because they were able to connect it with their culture," said teacher Irma Tiscareño. Many of the students at her school are Latino, she said. They were introduced to hibiscus, an herb that many of them knew by another name. "In Spanish, the name is jamaica. The flowers are used to make a drink that many of them enjoy." Tiscareño was pleased to see her students, some of whom had no prior experience with gardening, making connections between their class lessons and discussions and the plants growing in the garden. "I noticed some of the kids were examining the roots as they were planting their herbs … and seeing how the plants get their nutrients." They also discussed how the soil quality could be improved by adding composted items, like eggshells and coffee grounds. 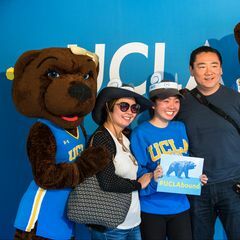 Before leaving, each student was given a plant for their own garden at home or one belonging to a friend or family member, said Tiscareño, who planned to return to the UCLA garden again with her father. The education potential doesn’t stop with schoolchildren, said Slusser. It also extends to medical students and health-care providers who might want to use natural herbs themselves or for their patients. It’s important for medical practitioners, especially in a culturally diverse city like Los Angeles, to be aware of the plants that are being used traditionally, their properties and how they may complement or conflict with modern medicines, she said. 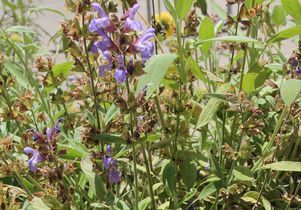 "We’ve had several residents research scientific compounds and traditional uses for the herbs in our Mexican herb bed," said Slusser. "In addition, several reported patients in clinic who found it comforting and familiar to use herbal medicines. Those residents found it useful to know something about these plants." It is important for doctors and patients to maintain open lines of communication to ensure that the medicinal herbs patients may be using don’t conflict with any prescription drugs they may also be taking, she said. Medical treatment and health promotion can be successfully attained through a delicate balance between traditional and modern medicine, she said. "Both have a place — the traditional often more as preventive — and many modern medicines contain, or are built around, the compounds found in plants." 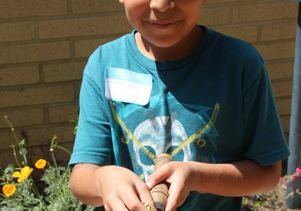 Area schoolchildren were invited to learn about medicinal plants and help put some into a new garden on campus.